Orange juice has long won the love of the world the adherents of a healthy lifestyle. It is valued as a unique storehouse of vitamins, organic acids and trace elements. This drink supplies the body with essential nutrients, but is low in calories – no wonder it is extremely popular amongst dieters. 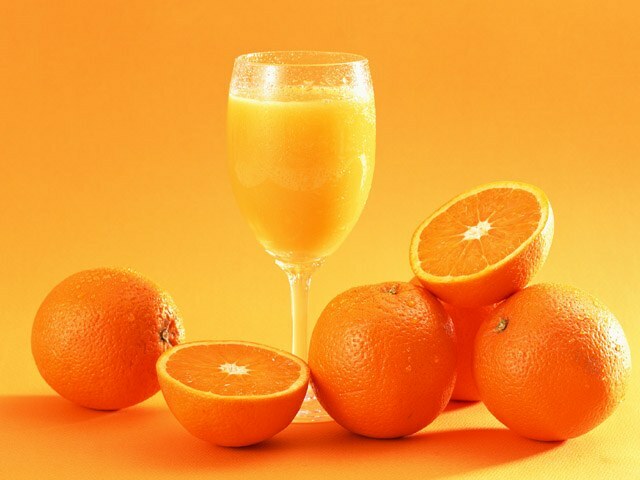 The most useful and tasty drink - fresh, so cook orange juice is recommended with their hands. The easiest way to squeeze orange juice at home is to use a special juicer for citrus. Before cooking juice thoroughly rinse the fruit and removing the peel, divide it into halves by a transverse line. If necessary, remove the seeds. Put each part of orange to the rotating mechanism of the electric device flesh down, skin the top. Pressing down on the fruit, squeeze the juice. On the above sample function, if the economy is a simple manual citrus juicer – but will have to make more effort. Before cooking the orange juice in the universal juicer wash the citrus, remove the peel sharply sharpened knife and slice the fruit into slices. Remove the seeds and place the orange slices in the device. Turn on the mechanism. If the functionality of the juicer includes adjusting the amount of pulp, be careful with the right settings. Don't forget to prepare a container to collect the fluid. Can't drink orange juice with your medication: it can reduce their healing effect, and even cause serious damage to the body. Citrus juice is prohibited for people with gastrointestinal diseases, allergies and diabetes. Washed, peeled and chopped raw material can be scrolled in a food processor (blender) until puree mass. Add the pulp of the necessary quantity of cold filtered water and adjust the resulting mass to your taste and again scroll to a liquid state. After the drink infusions (for three to five minutes) you can serve it on the table. Finally, in the absence of special instruments can try to make orange juice by hand. To do this, blanch the fruit in boiling water for 2-3 minutes, then cut it in half. Squeeze the juice, squeezing an orange with your hands on both sides. Usually from one of ripe fruit you can get 90-100 grams of juice. If desired, filter the prepared orange juice or add pulp from the fruit, collecting it with a spoon. Before use, the drink will cool. The high content of ascorbic acid and sugars in orange juice helps the recovery from illness or extreme fatigue, and supports the weak vessels, vision, kidneys, and liver. Fresh oranges can be delicious refreshing drink. Two of the largest fruit you will need 2 teaspoon of citric acid, 0.5 kg of sugar and non-carbonated bottled water (4 liters). Washed raw blanch in boiling water for a minute, then allow it to dry completely and soak over night in the freezer. Hold the frozen fruit at room temperature for 15 minutes, then quickly defrost in a microwave oven. Peel the oranges peeled, chop and mince (scroll in the blender). Fruit pulp cover with cold water and leave for half an hour drink. After that, strain the juice, add the sugar and citric acid. After 2 hours, the orange drink is ready. Vitamins, minerals, organic acids and many other essential body the beneficial nutrients you find in fresh orange juice. This healthy and incredibly delicious juice is low in calories, so it is very appreciated by those who is losing weight and is a supporter of healthy eating. Oranges, knife, electric or manual juicer, blender or food processor. Fresh orange juice simple to prepare at home. For its preparation requires only one ingredient – fresh oranges. First and foremost, you need to carefully rinse each fruit. Take a well sharpened knife and peel the citrus from the peel, then slice the fruit and remove the seeds from them. Put orange slices in a conventional juicer and, after selecting the necessary settings, turn it on. To correctly calculate the necessary amount of juice, it should be assumed that from one fruit you can get up to 100-120 ml of pure juice. Juicing in a special citrus juicer is the simplest way. For this you need to wash the oranges, divide each pepper in the citrus line into two halves, with peel should not be removed. Remove the orange halves, the seeds, after which slices need to be put on the rotating mechanism of the juicer pulp down, pressing lightly on the fruit on top. Special citrus juicer can be electric and manual. However, the principle of extracting the juice in the other juicer of the same, but only the manual will require more effort. You can also note that if you use a juicer manual type, you can add the pulp into the juice. To do this, take a small spoon and vystrelit orange pulp, then add into the drink. Juice get the most satisfying. If you have no electric or manual juicer, then the orange juice can be prepared using a blender or food processor. Rinse and clean the fruit, chop them into small pieces of size 3 see If there are any bones, remove them. Put the pieces in the device and in the mode of pulsation grind to a medium level. Then you can enable continuous mode and grind the fruit up until they will turn into mush. The preparation of fresh orange juice without the help of the available tools and kitchen appliances. Take a clean orange and carefully knead it in your hands, then divide into two halves. First hands squeeze the juice from one slice, then from the second. Thus obtained pure juice and no pulp. After making orange juice you need to drink through a straw, because it reduces the risk of getting citrus juice on tooth enamel. So you will be able to maintain a healthy smile and enjoy a pleasant taste. 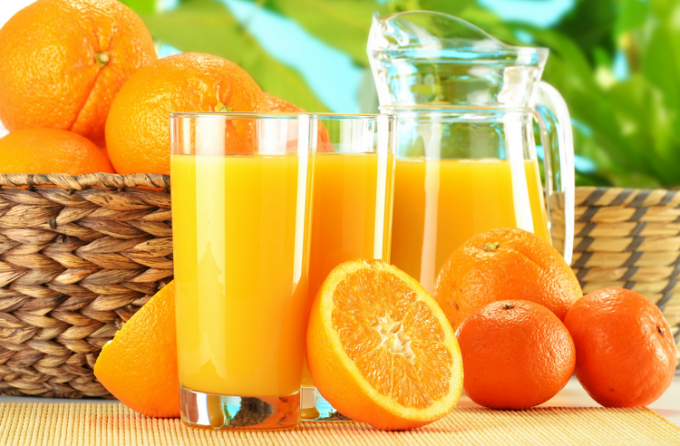 Orange juice is better not to drink on an empty stomach, such as acidic drinks irritate the stomach lining. Doctors recommend to dilute the juice with water in a ratio of 1:1 and drink it in the morning, then all the useful microelements and vitamins contained in the drink will be better absorbed in the body. Buying any fruit in the store, you need to cut the skin, so as to prolong the shelf life of the fruits treated with chemicals. Fresh juice is better to drink it immediately after preparation, because after 10-15 minutes the vitamins begin to break down when interacting with air.